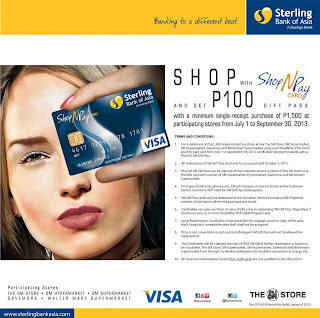 SM Gift Pass w/ Visa Debit ~ Philippine Freebies, Promos, Contests and MORE! Shop at any participating SM and Waltermart supermarket using your any of your Visa debit and ShopNPay pre-paid card to be entitled to an SM Gift Pass. Simply spend at least P1,500 then surrender your original copy of the sales draft at the Customer Service Counter(s)/Bills Payment counter of the branch where you made your purchase. It's that easy! Remember, you can only use three (3) sales drafts a day in redeeming the gift pass regardless of the number of ShopNPay card you have.